Documents Malone's service learning trip to China. We are safe and doing well in Chang Sha. We split into two groups today to work at ICC and Butterfly House. Will reverse tomorrow, then leave for National forest and return two days later. 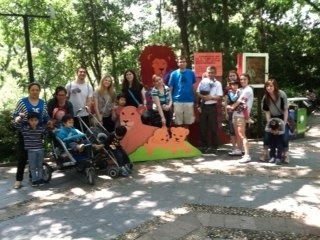 We all had a beautiful day today visiting the zoo with the children we met earlier at Shining Star. Each child seems to have found a place in our hearts which made parting with them rather difficult. I found myself growing quite attached to the oldest boy of our group, a boy aged nine named TaoTao. Within a few minutes of our trip he informed me that today was Elephant's birthday and there would be a party for him at the zoo. TaoTao knows such things and we don't question him as about it-we just take him for his word. As a result when we showed up elephant had a full group of us singing him happy birthday. I think it was TaoTao's favorite part of the trip. For the rest of us our highlight was seeing the zoo's pandas. What an experience. Today we left the New Hope Foundation and it was bittersweet. I wish we would have been able to spend more time there, but it was time to move on to the rest of our trip. After that, we went to the Great Wall and the Beijing Olympic Park. Out of the whole day, I would say the Great Wall was my favorite. Even though it felt like I was hiking for many hours, it was worth seeing something that most individuals will never get to see in their lifetime. May 10th: A Day Spent with TJ's Girls! Yesterday morning, TJ's girls took us to the local farmer's market. The market was filled with stands selling fresh veggies, fruit, and even live eels! Here we bought all of the ingredients needed to make Chinese dumplings. After our visit to the market, we made these delicious dumplings with the girls. Later, Dr. Chen suggested that we take the girls to do karaoke in downtown Shanghai. Our afternoon was filled with singing, dancing, and just spending time together. We had a wonderful time and the girls seemed to enjoy it as well. The time we have spent with the girls over the past week has been such a blessing. I am thankful for the opportunities we have had to get to know the girls while sharing exciting new experiences with them.